Borges, Nabokov, Calvino: and Coetzee! Surely Auster's first novel was Squeeze Play? 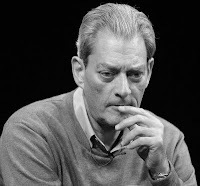 Written under a pseudonym, Squeeze Play is “not a legitimate novel,” Auster said much later. So I guess it all depends, Josh.